Solar PV Market Size Is Projected To Touch 489.79 GW By 2020: Grand View Research, Inc. The global solar PV market is expected to reach 489.79 GW by 2020, according to report published by Grand View Research, Inc. Continual technological advancements in energy sector to develop secure, sustainable, and affordable energy systems can influence growth of market. According to a report by Grand View Research, Inc., global solar PV market is anticipated to reach 489.79 GW by 2020. Growing requirement for sustainable resources of energy attributed to stringent regulations to reduce dependency on fossil fuels is anticipated to propel demand for solar PV. These power generation systems are likely to offer reduction in carbon footprint, low cost energy generation, and contribution to sustainability. Continual technological advancements in energy sector to develop secure, sustainable, and affordable energy systems can influence growth of market. Supportive government initiative to promote use of renewable sources of energy and reduce carbon footprint for healthy environment can spur market growth over next few years. Rising scarcity of fossil fuel resources coupled with high demand for durable energy sources can spur growth of market. Growing adoption of renewable resources attributed to rising consumer awareness regarding cost benefits of technology can influence market growth over the forecast period (2012 to 2020). The solar PV market can be segregated on the basis of application and region. Based on application, the market can be categorized into non-residential/commercial, residential, and utilities. In 2016, utility segment dominated the market and accounted for 47.2% of overall demand. Continuous supply of energy coupled with low expenses as compared to conventional sources of energy are expected to surge demand for solar PV technology in utilities. This, in turn, can influence growth of market. Similarly, residential segment is likely to expand at CAGR of 21% over the forecast period. 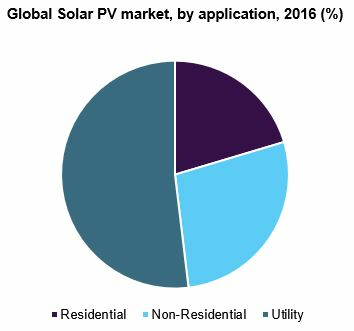 Growing popularity of photovoltaic systems attributed to its employment in electricity generation to deliver heat for residential buildings at low cost can fuel growth of market during the forecast period. In 2016, non-residential segment accounted for 26.3% of overall market share. High adoption of solar PV power generation systems in industrial applications for fulfilling heating requirements accounted for segment growth. Regional segmentation includes Europe, North America, Asia Pacific, Latin America, and rest of the world. In North America, the market is expected to witness significant growth over the forecast period. Numerous projects initiated by Mexican government related to photovoltaic, solar, concentrated solar power (CSP) can fuel growth of market in the region. One of these projects is likely to be a photovoltaic project of 46.8 MW capacity in Puerto Libertad, Sonora. In addition, World Bank is expected to fund USD 50 million for combined cycle gas turbine plant of 14 MW capacity equipped with troughs to collect energy, located in Agua Prieta, Sonora. In addition, United States (U.S.) is likely to provide multi-year extension on tax credits for renewable energy plants such as concentrating solar plants (CSP). This, in turn, can fuel growth of market in the region. Similarly in Asia Pacific, the market is estimated to grow well over the forecast period attributed to increase in annual PV grid capacity in China in 2016 as compared to 2015. It accounted for PV grid operational capacity of 34.5 GW owing to installations of solar thermal PV plants & power stations in the region. This, in turn, can fuel growth of market over next few years. Moreover in 2016, Asia Pacific accounted for 17.9% of overall market share attributed to supportive government regulations to install clean energy resources and reduce air pollution. In Europe, the market is estimated to grow slow as compared to other regions owing to early adoption of technology in the region, which led to saturation of market. Some of the leading companies offering solar PV are Kyocera Corporation, Yingli Green Energy, Suntech Power, First Solar, and Canadian Solar. The market is expected to be highly competitive in nature. Buyers and manufacturers are likely to get indulged in strategic partnerships. In addition, most companies can invest in R&D activities to develop advanced solar PV offering less impact on environment. Moreover, companies are also expected to come up with innovative systems that can offer long-term energy storage solutions to fulfill year-round need for power generation.